Trains Story Puzzles - The Little Engine Who Saved the Carnival! 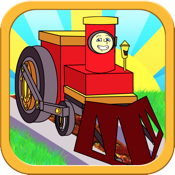 Watch the fun cartoon Train Story and play with fun puzzles! Trains Story Puzzles keeps your little conductor entertained while sharpening the mind and developing coordination. - Good fun that kids love!